If the power goes out (grid down) and the electricity is off for a period of time, you will need an alternative method of cooking without electricity. Even your kitchen’s gas stove might require electricity to operate, so it’s best to consider multiple ways to cook and/or to boil water. One obvious cooking alternative is by way of a wood fire, perhaps with a cooking grate placed over it supported by logs, stones, bricks, etc. A ‘rocket stove’ is an efficient way of utilizing a controlled burn of a wood fire – a method which uses little firewood to create a quick hot fire. There are several popular varieties available. A Dutch oven cooker either hanging on a tripod over an outdoor fire or setting directly in a bed of hot coals (or hot coals on top of the Dutch oven’s cover) – perhaps in your fireplace if you have one. Good Dutch ovens are made of cast iron (they retain heat longer). Your barbecue grill is a likely option for cooking without electricity (until you run out of fuel), be it charcoal or propane gas. Always keep a full (large) tank, and preferably an extra tank (filled). If you use charcoal, when it goes on sale buy extra bags. NEVER cook indoors with a bbq grill. A solar oven can be very effective during the summer months, during days when there are few clouds – however this will be a limited use option. Nonetheless a solar oven is yet another alternative method of cooking if you are so inclined. Your geographical location, weather, season, and the efficiency of the solar oven will affect your overall success. I happen to have this solar oven and have used it with very good success. ‘Sterno’ heat (canned heat) like those which are used by caterers – may be used indoors and are effective for cooking. The canisters contain an alcohol-based ‘gel’ fuel – which does not spill and will burn for a few hours. You will need some sort of stand to hold your cooking pot over the canister. A good choice for safer cooking indoors is a single burner butane stove. There are all sorts of camping stoves which will enable cooking without electricity. Some of them are fueled from small butane canisters, many others use propane, and still others by liquid fuel (e.g. Coleman white gas). Be wary of the dangers of carbon monoxide. Unless your specific camp stove indicates that it is safe to cook indoors – assume that it is not. 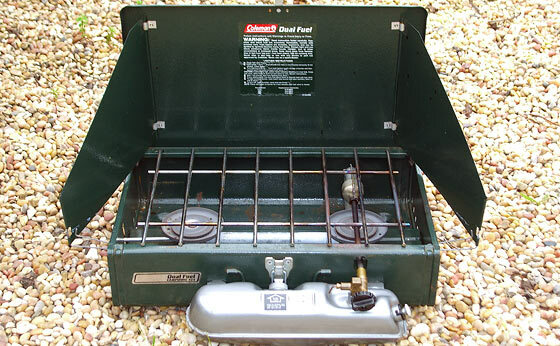 One popular camp stove which has been around ‘forever’ is the Coleman camp stove. I have had two of their dual burner liquid fuel stoves during the past 20 years and have been very happy with them. They seem to be built to last. I use the liquid fuel model because it seems a bit more rugged, it holds larger pots without issue, it will heat up very quickly, and I’ve simply been familiar with it for many years. I believe that liquid fuel is more practical when it comes to storage space versus the propane canisters because you will get far more cook time from a gallon can of white fuel versus an equivalent size can of propane fuel (for example). White gas‘ is a special Coleman blend which is orderless, has rust inhibitor in it, and is available in one gallon cans at nearly every store that sells camping supplies. Although the Coleman white gas fuel has a supposed shelf life, i’ve used it far beyond a supposed expiration, and have had zero problems (as in 10 years!). According to Coleman documentation you can even use unleaded gasoline in their dual-fuel model stove as a substitute for their Coleman fuel white gas. I have not tried this, but it is good to know of an alternative fuel source. 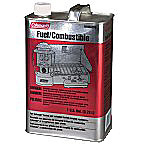 A one gallon can of Coleman fuel will provide quite a lot of cooking time, and is well worth stocking several, or more, in your survival preps if you have this type of stove. I’ve even read comments reporting no problems or issues with the fuel even after 15 years, as long as the screw top is secured. Just remember to filter the Coleman fuel as it is poured into the tank, in case of sediment. Unleaded gasoline however will not store well for that long, and I recommend adding a fuel stabilizer additive such as PRI-G or STA-BIL if it will be stored beyond several months. During emergency cooking without electricity, be aware of safety considerations – especially since this is not your normal way of cooking. Consider ventilation, the dangers of fuels, and the dangers of fire itself. Any other ideas out there for cooking without electricity? A couple of years after I bought my Coleman stove I found an attachment where you could convert to propane. I bought this and actually use it more than the Coleman fuel. It just gives another fuel option should you find yourself short on Coleman fuel. I have many small canisters but I also have the attachment so you can run the Coleman from a 5 gal container of which I have about 10. I would be interested if anyone has done a comparison to how long you can cook on one as opposed to a gallon of Coleman fuel. Propane lasts forever as far as I know. Got lucky at a yard sale last week, found 2 dual fuel Coleman’s one new still in the box, for $20 each. It was the first time I tried unleaded gas, I admit it made I scared to light it up knowing I was using pure gasoline. All went well just like can fuel. Now I have more options for cooking outside. Great information. Thanks. made “Crab Soup” on one last winter during the Ice Storm. Also had the house rewired with a Main Breaker box and a Sub Box and wired for a generator. The sub box handles lights, refrigerator, garage door opener (I’m in a wheelchair) and heat. I have a 2 burner sterno stove. It looks like a propane or white gas camp stove, but when you open it, it has 2 sockets to set sterno cans in. After you light the sterno, there is a hinged chimney that goes over the top of the sterno can and intensifies the flame. I buy my chafing fuel at sam’s. It’s $13.00 for 12 cans. I have also used my buddy heater for heating up canned foods. My Family and I make prepping fun by having what we call “Caveman Cooking” nights, where we will cook dinner on the fire pit out back, sometimes even when it is raining. We have done breakfast before as well. It’s fun, tastes a lot better and keeps us skilled in outdoor cooking. As a kid I remember my mother cooking in the fireplace after we lost power in the winter during a storm. She wrapped potatoes in heavy duty aluminum foil and placed them in the coals. She also put hot dogs on long metal skewers and cooked them over the fire. She had cooked a couple of other things too, but I just don’t remember what they were. Remember in SHTF situation, the smell of your cooking can travel a long way, and wood fire smell can travel miles. Trust me when I say that you will want to cook indoors in a blocked out room at night and everything for the day at one time. The smell of your cooking will travel and if anyone smells it they will come looking for the source when they are hungry and have a family to feed looking for a handout. Yep, I have a solar oven, propane stove, butane stove, my backpacking stove & an Eco Zoom. Plus a Traeger smoker than does use a little electricity, but my solar generator can handle that with no problem. Of course there is always an open fire which I love cooking on. Joe, I like your idea for caveman nights. I just might have to use that idea. If you can your food, before the shtf, there is no cooking involved, no smells generated, no time spent cooking, and, no fuel used. Can what goes onto your cooked rice and beans, such as meaty sauces, and worry about cooking the rice and beans themselves, without spices, or anything which creates a pungent smell. Bland rice, water braised beans, produce less smell to attract the zombies with guns. I have not canned, but it for sure seems like one of the better things to know. was thinking, that one could cook up rice, especially brown rice which does not get soggy, and fill your jar half full of rice, then add meat sauce/veggies/ beans, can, and have complete meals ready to warm. that way, no water is needed to prepare meal, etc. Also, seems like it would be a nice/tasty quick supper. Can you can different things like this in one jar? Do not can rice. Can beans. The rice will go bye-bye during the 90 minutes of processing in a pressure canning pot. Just get some ham, or bacon, onions, etc., and make what you will combine with your beans..such as Great Northerns…to flavor them. Simply soak your beans overnight and let them swell up. No need to cook them ahead of time. Fill your quart jars about 2/3 full with uncooked beans..then pour in your ham,bacon,onion,carrot,etc. broth. Leave 1 inch of head space in the jar, and process at 11 psi for 90 minutes. The processing time will perfectly cook the beans and allow the broth to full involve them. A complete mean in a jar, which you can eat cold, warm, or hot. You can even pour the ham&beans over your rice to extend the meal, and provide a complete protein complex. Look up such recipes on the web and spice the beans as you like them..maybe adding red pepper..and salt to taste. Your recipe, and complete control over what is in the jar. I know some people that will make a large batch of soup, stews, and other complete meals, and can them. That way they just have to open and heat, so there really is no smell for the short time it takes to heat the food. I have never done this, but it does seem like a good idea. One can heat the entire jar of food itself, before you even open it. Set it in the sun, place it in hot water bath, place on hot engine manifold, set over a single candle, place over an oil lamp..etc. Can pasta sauces, can pie filling, can skinless chicken thighs and drumsticks, can pulled pork in bbq sauce, meatballs, stews of all kinds, chunks of beef, potatoes, any high value food. Two cases of quart jars, kept in their original packing cartons, put in the trunk of your car, will supply two people for quite some time (24 days), and takes up the space of one suitcase. Just toss in a 20 pound bag of medium grain rice..and it IS a months worth of food. Now, just worry about water and how you cook the rice. I’ve watched Coleman fuel go from $9 a gallon to $12 a gallon in 4 years. I have been using dual fuel lanterns and stoves (I have two of each) for a couple decades. I always use unleaded gas. You can buy it cheaper than colemans white. It is more readily available and if you need to you can siphon out of gas tanks. I live in colorado and altitude has never been an issue. I have stocked up on a number of alternate heating systems. I also have a couple of different bar-b-que grills, three cast iron pans/pots, charcoal lighter, and several bags of charcoal. I also have a folding stove that takes ThermaFuel. Again, you are supposed to be able to use those indoors. I have a couple of cases of ThermaFuel. I also have two cases of denatured alcohol that I bought to use in one of those indoor table-top fireplaces. The fireplace was defective, so I returned it, but I still have the alcohol. I read that you can make a small stove out of pop cans and use alcohol, but I haven’t tried it. I also stocked up on food that doesn’t need to be cooked, including crackers with cheese spread, nuts, cookies, canned fruit and tomatoes, canned tuna and salmon, jerky, canned milk, powdered milk, dried fruit, cereal, ‘Ensure’ type instant meals, fruit juice, etc. And I have a part of a case of MRE’s with heaters. Posted this the other day. Guess it didn’t take. During Hurricane Sandy- 12 days with no heat or electricity for me. I heated water for tea and rice using a small folding sterno stove. I also had a single burner propane burner. I use 1 1/2 small propane bottles over that period. IIRC, I used 2 sterno cans also. A few notes to save fuel- always use a lid on the pot water, food heat up quicker. I also used a small pot lid on the skillet to cook hamburgers faster. Rice, dried beans, can be soaked in water before cooking to speed up cooking. I had the Coleman liquid fuel stove but there was no need for that. When the power was restored I bought a Coleman 2 burner propane stove- each burner is independent of the other. It is easier to cook on that then the single burner propane stove. The Coleman stuff is simpler then many other gas&propane Stoves and lamps. But this is not a bad thing. Coleman 424 and 425 are rugged, but they tend to rust… you can run them with unleaded gas… no Problem. But if you use coleman stoves and Lamps, keep another generator aside… you can restore “drain out” generators etc. but they are not expensive and having a spare make these pretty reliable things even more reliable. But watch out, CO is not such a big deal, these things are easy to use but not idiot-proof so dont forget about fire-prevention if you use these in or near your house. We have a wood cookstove (4 burners and an oven) that we purchased a few years ago (an antique Loth stove, not new one). We also have a wood stove but it will only keep something warm on the surface, not cook something in a skillet or pot. Our main cooking stove/oven runs on propane but when the grid has gone down, the oven won’t work (electronic ignition). The burners will work by hand-lighting them, though. We also have a rocket stove, a fire-ring and tripod set up for ‘campfire cooking’ w/ cast iron, a propane ring-burner set up, a gas grill, and a charcoal grill that we have used many times w/ small wood to learn how to cook this way w/out charcoal. We also have some thermos containers to cook things like rice and oatmeal. Haven’t experimented much with them but they’re here and at-the-ready if needed. We have more redundancy with cooking than any other activity because we grow so much of our own food and we need to preserve much of it, and we also cook everything from scratch. We also love to eat. 🙂 I can bake bread in a dutch oven outside but have yet to even try a solar oven. It just doesn’t hold the appeal for me since it’s a dedicated piece of equipment that is dependent upon lengthy sun exposure. I haven’t personally tried this method of cooking but am very interested in doing so. Take a pan of water and bring it to a boil. Then pour the hot water into a thermos. Add your rice, beans or raman noodles ( or whatever you want to boil )and set the thermos on it’s side. 15 minutes later give it a good shake and put it back on it’s side for an additional 15 minutes and you’ve got hot food with out the cooking smells that could lead to hungry looters causing problems. Was just two comments above I was considering making the same suggestion. I was reading a article a couple years back about Chinese peasants using thermos type vacuum containers to cook lunchtime noodles on the morning fire.Making the fuel used in the morning more valuable. I would suggest due to the fact that noodles,rice & etc swells when cooking you might want to use the soup type wide mouth thermos. As a Boatie, it is very common to “cook” this way on Ocean passages. 2/ reduces time slaving over a hot stove. 3/ good time management as it makes lovely hot food available later when required. 4/ Keeps all the goodness in. 5/ Requires less water i.e. no evaporation. 6/ Simple- even I can cook with the thermos method..
8/ only one container to wash. If you have a gas stove and the grid goes down its as easy as lighting a match to start it thats until you can no longer get any gas when the power gos out I was always able to use stove in spite of the electric ignition just by using a match so its not like you cannot use it. ‘Can’ separately because of different processing times. Mix when you cook them to eat. Also allows more flexibility in menu preparation. look at youtube how to make a solo stove. You can buy one of course but post-SHTF everything has a life expectancy and it would probably come in handy knowing how to make one from empty cans. I have a lot of cooking options but a homemade alcohol stove is hard to beat.They are easy to make have no smell and the fuel is cheap and stores forever.I have even poured into a used sterno can and used it. In 2009 we had an ice storm that left us in the dark for two weeks. I’m a prepper that lives in the sticks by the way. We cooked most of our food in a dutch oven over the fireplace. I cooked gumbo and rabbit stew that lasted a few days. I also had plenty of propane, gasoline, candles, and kerosene. We heated water from the creek for baths and for flushing the toilets. Heck, most of the time I just used the woods like an ole bear. LOL We also have plenty of two and four legged critters on our land. Needless to say, we stayed home and dealt with the sitiuation while everyone else was headed to the hotels. Same here. Married & moved East to heavy forest from desert ranch. We’re on a very high ridge, and I never got the evac orders when we had a massive flood. There was almost no warning, except the downpour didn’t stop, we got about 14″ in less than 20 hours. I was ‘trapped’ up here for 3.5 weeks, it was nice and peaceful, hubby was on deployment. I used my 1 burner GasOne butane stove indoors, the Big Kahuna wok stove outside when it wasn’t raining, didn’t use the grill. I usually cook Asian, which cooks very fast, mostly stir fry. If everything’s sliced pretty thin, it cooks thoroughly in 2-8 min, depending on stove and if meat is in it. We’ve got lousy grass, but chickweed, dandelion, plantain, cattails, Jerusalem Artichokes… lots of fresh forage for the wok. My 12″ carbon steel wok backpacks with us, only ‘pot’ we need, plus a kettle (I have 7 carbon steel woks). We have a revolving pantry that’s used daily, not packed away storage foods. I use Freezer Bag Meals a lot, keep a lot packed for meals, hiking & situations. Do a search on Google & Amazon for the site and books. Much better & way cheaper, than MRE’s. We usually have 20-30 gal water inside, plus a 55 gal water heater. I had 3 heavy runoff areas for water, plus the downspouts. We’ve also got two 1,000 or 1,500 gal cisterns that need cleaned. We have water purification chemicals and an AquaRain 1.5 gal water filter w ceramic filters better than Berkey’s. We also have 4 oil lamps with 7/8″ wicks, and 2 w/ 5/8 wicks, wider is brighter. A couple gal Ultra Pure lamp oil (no smell), several LED lanterns and flashlights, a 3 gal manual ‘washing machine’ and other various items made it easy. No, I don’t have or want a generator. I found out weeks later people on other ridges nearby were ‘safe’ but in bad shape as they never listened when locals told ’em to have a big pantry, AM-FM & All Hazard radios, water & purification, etc. I was the only one on our ridge and couldn’t have gotten to them even if I knew they were there. Lots of For Sale signs up as the city or suburban folk sold out and moved back.